Of course, nothing can ever be perfect, and every engine has it’s weaknesses. We wouldn’t have to keep buying new parts or new trucks if they lasted forever. In the case of the LWN, well it wouldn’t be a modern diesel without complicated modern emissions equipment. That complicated modern emission equipment has some…. tradeoffs. In fact, one of the main complaints so far has been that some of these trucks have already been throwing emissions codes because of a non-functioning, clogged up EGR system and related sensors going off for the DPF and SCR efficiency, in chain reaction to the EGR malfunction. Most of the time, a thorough cleaning of the EGR system can make the codes go away, but it’s just gonna be one of those procedures that will have to be added into your maintenance schedule as you rack up the miles. The DPF filter is also going to need to be replaced in the higher mileage trucks at some point, the clogging happens there as well. Even more so when the EGR isn’t working properly. And of course, the DEF isn’t going to fill itself. Properly maintained and working correctly however, these systems do work really well together to make the LWN one of the “cleanest” diesels available. What are the EGR, the DPF and the SCR/DEF injection systems? 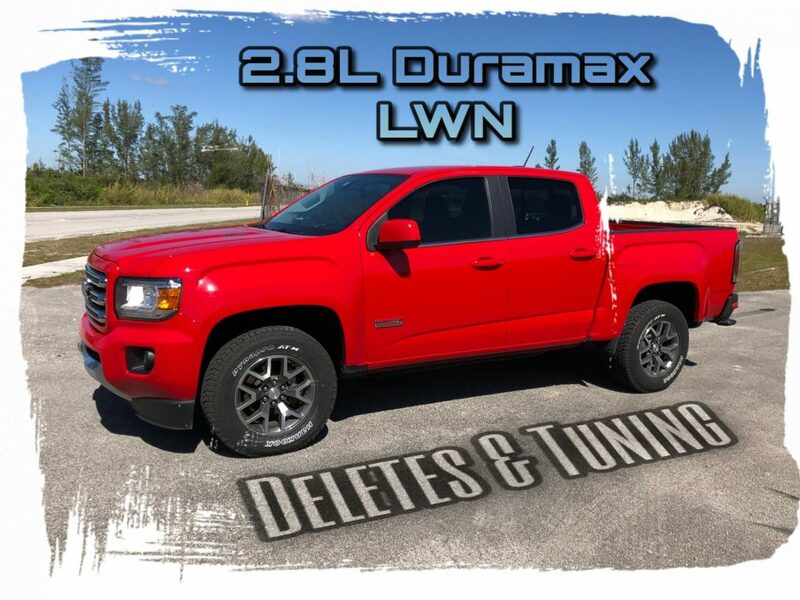 Should you delete and tune your 2.8L Duramax? The DEF system is what uses the urea fluid (aka blue def or adblue) injection into the SCR, vaporizing the fluid mixture into ammonia and carbon dioxide that can be filtered by this catalyst into nitrogen and water. In theory, this a great addition to the overall reduction of emissions output. In reality though, the urea mixture is a little too volatile for long-term reliability, especially in cold climates. Urea likes to crystallize and evaporate when exposed to cold temps or air, which can wreak havoc on the injection system. These systems have numerous sensors and a heating element contained in the holding tank, which get attacked by the corrosive fluid and will almost always fail over time in one way or the other. Overhauling these injections systems can get quite costly. In the DPF portion of the exhaust you have the filter that takes the remainder of NOx and filters out as much as possible by grabbing the carbon as it flows through the tiny passageways of the filter. As you can imagine, these passageways don’t take a lot to get clogged up, this is why you have what is called the “regen mode” which works by super-heating the filter to burn away carbon deposits. The burn is created by over-fueling the engine to make the exhaust gas temperature rise very high in order to vaporize deposits. Over-fueling does have the negative effect of also dumping some of the fuel into the oil, thereby reducing it’s longevity and lubrication effectiveness. For this reason, it is VERY important to follow the oil change intervals as closely as possible to combat the diluted oil. The DPF filter itself will also clog after some time, and require replacement of that entire section of the exhaust. The EGR system works to lower emissions by re-introducing some of the unburnt fuel in the exhaust back into the intake tract, thereby re-burning some of the inherit emissions that would need to be filtered by the SCR and DPF. Some form of EGR systems have been used on just about every modern engine to reduce the amount of emissions they produce and they have been proven to do just that, which is a great thing for the environment. However, they do come with a huge reliability drawback, especially on diesels, and that is the amount of gunk that clogs up not only the EGR system but also the intake manifold, valves and etc. Basically by allowing the EGR to do its job, you’ll also have to accept the fact that all that dirty exhaust is going to be recycled back into the intake of your engine, gumming up everything in its path. This is terrible for engine longevity. Tuning can increase the power to around 212hp and 412 ft. pounds of torque. By removing the clog-prone EGR and DPF, you will increase the reliability and longevity of your truck. On average, you will stand to gain an extra 5 MPG after the deletes. No more limp mode because of a clogged DPF or the frequent DEF system failures. This translates into much lower maintenance costs. Your engine will run cleaner by not having recycled carbon and fuel dumped back into the engine, which frees you up from low-ash type oil and allows you to run my favorite oil: Rotella T6. This is purely my own preference, but if you run without a muffler you’ll have much more pronounced turbo and engine sound with the exhaust restrictions gone. The biggest con to deleting your mini max is that the warranty can be voided by the dealership if they detect a tune (and they can, even with it returned to factory conditions.) Normally these systems are covered under the emissions warranty for 8 years/ 80K miles, which is actually quite generous, although I have noticed that a lot of times people are having clogged DPF filter and EGR issues right after the emissions warranty runs out. Legality is another con of removing emissions equipment, at least in the US. You need to be aware that these modifications are only to be used in vehicles that aren’t to be driven on public highways, as the US regulations have made modifications to these systems to be a fine able offense. Tell me how to remove it! So after careful consideration of the remaining value of your warranty and acknowledgement of your local laws, you’ve decided to delete your truck. Well, that in itself can be a little tricky; because of the newness of the LWN trucks some aftermarket manufacturers are still in development for this platform. That said, there’s some really good options already. Keep reading to see the breakdown of everything that you’ll find in a typical delete kit. The 2.8L Duramax AutoCals all come loaded with one DSP4 tune. 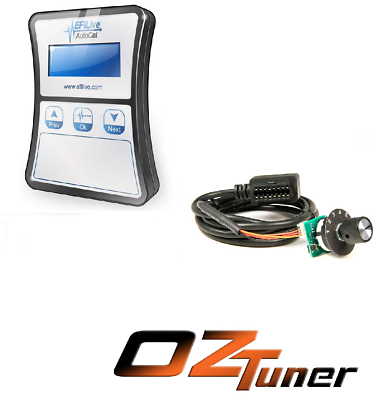 Each Oz Tuner calibration is built off of a basic good running calibration, and is then tailored specifically for your needs and applications. Each DSP4 tune is built with 4 power levels. Oz Tuner will not build lope tunes, nor will we build or endorse the use of ""Smoke Tunes"". Power levels are dependent on supporting modifications, but the basics of each level are described below. If you’re going to be running a delete tune, you’ll need to exhaust to support it. 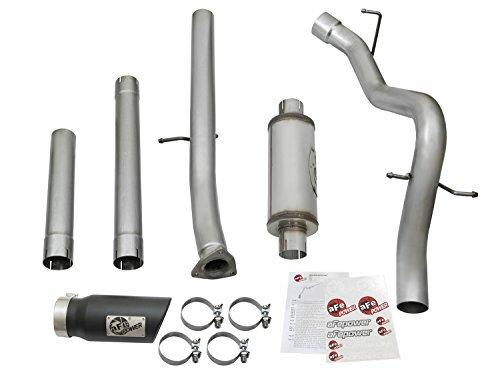 This exhaust replaces all the factory exhaust emissions components with a much less restrictive straight pipe and optional muffler. DPF filters and DEF injection systems are a big source of issues on these trucks, they are a part that IS going to need replacement at some point in the usable life of the truck. The funny thing is that they seem to be conveniently engineered to last until just after the warranty expires. Get ahead of the imminent failure and remove the factory exhaust to replace with this one. This is a "Race only" product used solely for competition. It's use is limited to closed-course and open-course racing that is formally sanctioned by a recognized racing organization. Simple installation: this system uses factory mounting locations providing stability and hassle-free installation. OE fit: OE-style bayonet hangers are used to maintain a stable pipe location during high vibration and high heat conditions. The bayonet tip holds the hanger bushing in place for an OE-style fit that does not change with time. Flow and performance: this large bore-hd exhaust system is constructed of 3" mandrel-bent stainless steel tubing for maximum flow. Smooth Transition bends allow for low turbulence, increasing horsepower, torque and lowering EGT's. 4-1/2" diameter black tip: finishing off the exhaust is a 4-1/2" diameter, black, stainless steel Slash cut tip with a unique stainless steel laser-cut aFe Power logo plate riveted on for an aggressive style. Removing the EGR system is vital to longevity on the mini duramax engine, as many drivers have noted excessive carbon buildup in the intake even before the first oil change interval. This extra carbon is a pretty much a universal issue on emissions controlled diesel engines, and it always results in the soot gumming up your intake and valves and contributes to an overall shorter engine life. As far as available options to remove the EGR on the Canyon and Colorados, OZ Tuning is pretty much the only choice for a well-built and complete kit. The actual installation process to remove the EGR on the 2.8L takes some mechanical ability to perform, but the end results are more than worth it. One caveat to EGR removal is that it WILL increase nox output, thus also increasing the amount of DEF that your truck will have to use in order to counteract. This is why it is recommended to perform both the EGR and DEF/DPF delete at the same time, otherwise you will risk having the engine computer raising alarms about the abnormal SCR utilization. 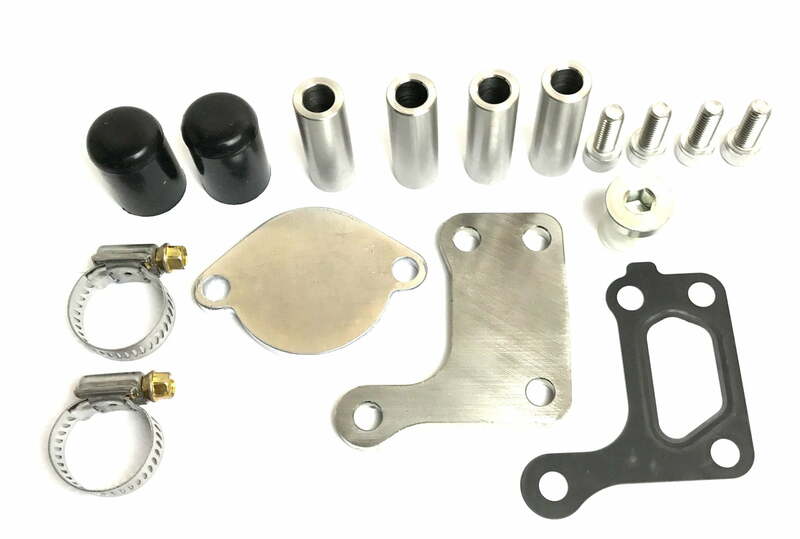 This kit includes all the block off plates and rerouting hoses that you’ll need to do a full EGR delete. Hopefully this guide has been helpful with your search to improve the reliability and performance of your Colorado or Canyon. As always, if you have comments or questions, feel free to ask away in the comment section below! Just had this delete done to my 16, Z71 2.8L Duramax. Complete delete with 4 stage from PPEI. It’s awesome. No DEF, DOF and No EGR to deal with anymore! Thanks for sharing your experience Chuck. Its such a relief not having to worry about those systems failing anymore! So what do we do with all the exhaust/egr/def sensors left behind after removing these systems. Won’t the computer go goofy not getting readings from these systems once they’re disabled? Great question! The engine computer would definitely go crazy with the exhaust deleted, unless you were to flash the OZ tune to it. The tune takes care of all the sensors and warnings for DPF and EGR. Hey Kevin, what you are thinking would not work without also flashing a tune to the ECM. If you try to remove the filter from the exhaust without tuning the computer, the sensors in the exhaust will tell the computer that the filter system isn’t working and you will get driveability errors. As far as who can help you locally, I don’t have any contacts in your area but I would suggest that you ask around with your local diesel repair shops for someone that can help with the install. I have updated the listing to tunes that work with the ’17 as well. I have a 2018 Chevy Colorado 2.8 Duramax, do you know if they have improved the system? My truck has been at the dealer for 15 days waiting for a new DPF. The truck only has 6000 miles on it, do you think I have a chance with a new DPF or did I get a lemon.